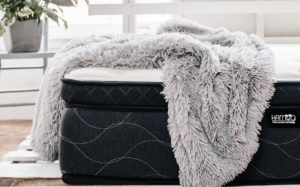 With the explosion of the online mattress (also known as the bed-in-the-box) industry, there seem to be new brands appearing in the marketplace at a rapid pace. 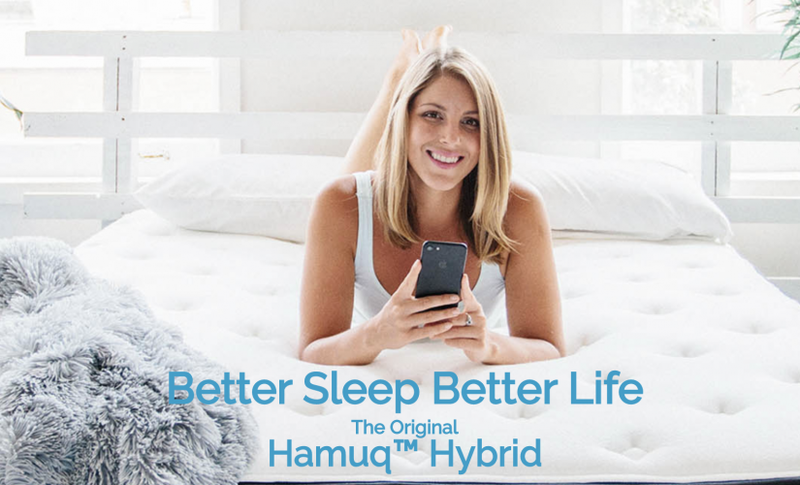 The Hamuq mattress from Canada is one of the latest that delivers straight to your door and gives you a long sleep trial to see if it’s for you. Here’s our review of this hybrid mattress, which combines foam and spring layers for maximum comfort. Launched in 2016 in Toronto, Ontario, the Hamuq mattress is only available in Canada currently as an online order. However, there are plans to expand into the United States. It is available in Twin XL, Double, Queen, and King. Currently, there is just one firmness option. The firmness is on the higher end but not the firmest one we’ve tried compared to the many U.S. bed-in-the-box mattress options. It scores fairly well on edge support. however, motion isolation and bounce are much lower. Overall, it’s medium-firm while the pillow top makes it feel a bit softer. Besides the advantages of convenience offered by all bed-in-the-box brands, this mattress has a luxurious pillow-top design and the comfort of the spring-foam mattress combination. The mattress company does offer free shipping with an easy pick-up for returns and a full refund if not satisfied. The average time from order to delivery is six business days. There were some cons like no lumbar support and no available California King mattress option. Also, the mattress top cover is not machine washable. Other online mattress companies also a longer sleep trial period. Compared to the Canadian competition, the Hamuq mattress costs about $150 more. The Hamuq mattress is 12 inches tall and consists of three layers. There is a comfort layer that has 2.5 inches of cooling gel foam used to control temperature and add comfort. This is followed by a transition layer that is 1.5 inches of memory foam, offering pressure-point relief. The support layer features eight inches of pocketed coils that add support. The white cover materials are made from cotton, polyester, and felt. The Hamuq mattress does have a policy about the environment. It is committed to limiting waste material and uses bio-foam materials, including soy oil. All returned mattresses are donated to charitable organizations. However, their green manufacturing practices are unknown. The mattress has a 15-year warranty. The Hamuq mattress offers an overall comfortable and medium-firm mattress option among Canadian bed-in-the-box companies with a slightly higher price point than its other Canadian options. 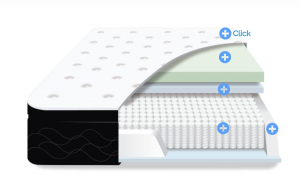 It offers a good combination of comfort and support, including the gel layer found in many hybrid mattresses for the cooling effect to combat body heat for better sleep. The U.S. online mattress companies, however, have many more options in terms of firmness and mattress size. It is a good starting option for those seeking a bed-in-the-box hybrid mattress for those that can access the mattress in Canada. And, if it was to enter the U.S., it would come in at a much lower price point compared to the bed-in-the-box companies located there.